If you’re an entrepreneur thinking about starting up a business, one of the most important early decisions you will be making is selecting a name for your small business. Resist any urge to decide this too quickly – because is one of those foundation decisions upon which your future business will be built …… Although nothing of course will ever take the place of a good idea that is supported by sound planning and measured execution. Never-the-less your business name will project a particular type of image in the eyes of your customers and getting the name right will help your marketing be a whole lot easier. In preparation for starting up your business, you’ve already decided the nature of the goods or services that you will be providing and you’ve determined the target market you will be pitching to. 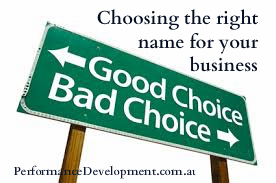 Now it’s time to think about selecting a business name that might connect with that market .And it is a decision that you will be living with – hopefully for, a long, long time. In the eyes of many people, your business name will be a reflection of what you stand for. A good business name will help win you customers. So what are some of the things you should consider when choosing your business name? Broadly speaking, the main issues are associated with legal and marketing considerations…. Your business name will need to be registered with ASIC (Australian Securities & Investment Commission), which will enable it to operate in any state or territory in the country. If the business is going to actually trade under a different name, then the trading name must also be registered. The name you select for your business should be short, punchy, memorable and have positive connotations associated with it. A short name is easier to spell, which makes it easier to both find and remember if someone is searching for your contact details online for example. They recall your name, but maybe not your phone number or exact location, so you want them to be able to find you easily when they search online. What some businesses have done to help with the memorability and recall of their business name was to select a “quirky” word that would be distinctive and original, for example Google, Bing or Twitter. You also need to think carefully about the connotations of any words you might select in your business name – and whether they might project either a strong or a weak image. For example, compare the name “Willow Leaf Transport” to “Stone River Trucking” ….. Would you say that the second name carries more of an emotional appeal …. maybe even a subtle suggestion of rock-steady reliability? Also, a good business name will readily convey to potential customers what your business does. This is why you see many business names include words that are descriptive of what they do – landscaping, plumbing, training or home extensions actually appear in the business name itself. Some business owners choose to combine their personal name (usually surname) with a descriptive word – for example Evans Computing, or Taylor’s Carpentry Services. Other business owners include the region or area their business will service, for example Eastern Region Gardening, or Sunbury Motors, or Bayside Computers. You just need to consider hat if you choose to use a location in your name whether it could limit the opportunity for future expansion of your business beyond that region or area. You might want to brainstorm some potential business names and then test their impact with people you know who fall into your target market demographic. In other words, even though it can be easy to get the opinions of friends and family about what they think of different possible names – if they are not representative of your actual target market then their feedback may be misleading. Just first check with ASIC that any business names you will be testing are actually available and not already registered – otherwise you’ll be wasting your time.